HP Umpire Tony Randazzo ejected Astros Manager AJ Hinch (strike three call; QOCN) in the top of the 6th inning of the Astros-Indians game. With none out and one on (R1), Astros batter Alex Bregman took a 2-2 fastball from Indians pitcher Trevor Bauer for a called third strike. Replays indicate the pitch was located off the outer edge of home plate and waist-high (px 1.089, pz 2.667), after which Randazzo called three consecutive balls to ensuing batter Jose Altuve, the call was incorrect. * At the time of the ejection, the Indians were leading, 3-1. The Indians ultimately won the contest, 10-9, in 14 innings. This is Tony Randazzo (11)'s first ejection of 2018. 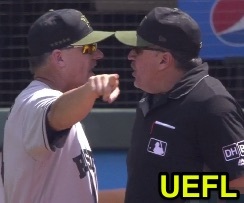 Tony Randazzo now has -3 points in the UEFL Standings (-1 Prev + 2 MLB - 4 Incorrect Call = -3). Crew Chief Bill Welke now has -1 points in Crew Division (-1 Previous + 0 Incorrect Call = -1). *The 2-2 pitch was located 2.100 horizontal inches from being deemed a correct call. This is the 48th ejection of the 2018 MLB regular season. This is the 20th Manager ejection of 2018. This is Houston's 2nd ejection of 2018, T-1st in the AL West (HOU, SEA 2; LAA, TEX 1; OAK 0). This is AJ Hinch's first ejection since September 24, 2017 (Will Little; QOC = Y [Check Swing]). This is Tony Randazzo's first ejection since August 10, 2015 (Pat Murphy; QOC = Y [Balls/Strikes]).